I have a gl1500a. My bike does not have the recessed area for the tag but a red plastic cover with running and brake lights. The tag attaches to a piece behind the plastic cover. I have look everywhere for the mounting part but cannot find it in any parts diagram breakdowns. 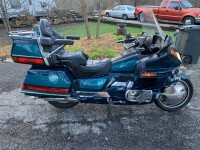 I found a bike with my type license cover on youtube at "honda 1995 goldwing gl1500 #17". I'v attached a photo of the part I need. I HAVE NO IDEA OF WHERE TO GET THIS PART. What year is your 'Wing? I'm doing some image searches and all the ones I'm finding show a recessed area for the licence plate. I personally have never seen a 'Wing with a flush mounted licence plate with lights behind the plate. The part in the picture is an aftermarket one. For the OEM part you can check the link below. either way I think you are looking for part 16, hopefully this points you in the right direction. I think the last part of the part code signifies the color. Looks like it might be a SIMPRO or LEGA-LITE light assembly. Original had brake and backup lights but were known for getting hot and deforming the plastic lens (which you appear to be missing). I have seen a couple posts where people have replaced the bulbs with LED and crafted new lens from clear or opaque plastic painted with model paint for the red brake portion. Are you all set with what you need? Determined it is a aftermarket item. No parts avail anymore Will revert back to the original assembly by Honda.